#1 Best Small Town In New York & #11 In The U.S.A. The 100 Best Small Towns In America. LOCATION: 180 miles north of Albany, 50 miles southwest of PLattsburgh, 9 miles from Lake Placid, in Adirondack Park of northern New York State. GEOGRAPHY/CLIMATE: Elevation 1,600 feet, in mountains, lake and wooded terrain surrounded by the largest area of preserved wilderness land east of the Mississippi River. Long cold winters with average snowfall of 133 inches. Average temperatures: winter low, 5: high, 27: summer low, 50: high, 75. Average annual rainfall, 39 inches. EMPLOYMENT: Tourism, outdoor recreational attractions, government and service jobs provide broad underpinnings of local economy. Larger payrolls: Adirondack Medical Center, general hospital, 535 employees; North Country Community College, 143 permanent, 300 adjunct; Paul Smiths College, 350; Adirondack Correctional Facility, 328; Federal Corrections Institute, 311; Saranac Lake Central School District, 310; American Management Association, AMA's logistical support center, 261; Village of Saranac Lake, 70; Trudeau Institute, Medical Research, 60; Olympic Regional Development Authority in nearby Lake Placid, employs 550 peak season. HEALTH CARE: Adirondack Medical Center, 100 beds, 50 physicians, 13 dentists in local practice. SCHOOLS: Elementary, middle, and high schools enroll 1,726 students total. Saranac High School sends 35-40% of graduates to 4-year college, same proportion to 2-year. Average SAT scores for 85% of eligible students taking test: verbal 450, math 495; both above national averages. Composite ACT 23.2. Public school expenditure per pupil, $7,778; state average, $8,241. Also in town: Adirondack Educational Center vocational-technical enrolling 70 students; St. Bernard's Elementary, 1-5, 158 students; Paul Smith's College, School of Forestry, Hotel and Restaurant Management, 800 students. North Country Community College offers various associate degrees including nursing, radiological technology, business, enrolls 1,717 students. EDUCATIONAL LEVEL: 13.8% of local residents have a bachelor's degree or higher, state average, 23.1%. LIBRARY: Saranac Free Library, 35,000 volumes. RECREATION: 12 public Parks including tennis courts, playgrounds, bathing beaches, boat-launching sites, bandshell, arboretum. Mount Pisgah Ski Center at northern edge of village has slopes for novice to expert. Surrounding wilderness area dotted with many small lakes and campsites, great flyfishing/angling, canoe routes, horse and snowmobile trails. Cross-country skiing at Dewey Mountain. Civic Center Ice Rink. Bowling lanes. 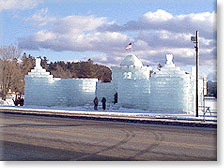 Biggest annual event is the Winter Carnival, held during the week closet to Lincoln's Birthday. New in 1995: Riverfest & Festival of the Lakes. Saranac Lake is 15 minutes from Lake Placid, site of the Olympic Games and a tourist center. HOUSING: Existing 3 BR, 2 BA house will sell in range of $60,000 to $150,000 depending on location and condition. 70.5% of housing is owner-occupied; state average 52.2%. UTILITIES: Electricity, 10 cents per kilowatt hour; propane 99 cents to $1.14 per gallon. TAXES: Retail Sales, 7%; state income, 4% to 7.875%. CHURCHES: Baha'ii, Baptist, Christian Science, Episcopal, Non-denominational/Full Gospel, Lutheran, Presbyterian (2), Roman Catholic, United Methodist. FURTHER INFORMATION: Patrick McDermott, Executive Director: Saranac Lake Area Chamber of Commerce, 30 Main Street, Saranac Lake, NY 12983. 800-347-1992 / 518-891-1990. Click here to view the many links we have to show that are there to help you learn more about the tri-lakes and what the are has to offer. E-Mail: S. Curtis Hayes, Inc.